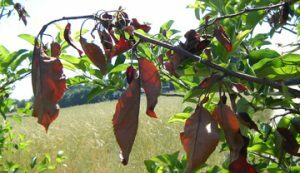 Have you ever driven around in late spring or summer and noticed a branch here and there on a Bradford pear tree that looks like someone took a blowtorch and scorched the branch? The branch has a hook on the end, the leaves are still attached to the stem, but the leaves and branch are dark brown or black. The problem is most likely fire blight. Fire blight is a bacterial disease named Erwinia amylovora. This bacterium infects many plants in the rose family including apple, pear, hawthorn, pyracantha, quince, and spirea. The most commonly infected are varieties of apple and pear. By the time most people notice this disease, it’s already into the plant. The only way to keep it from spreading is to prune the infected branch or twig off. When doing this, it’s important to sterilize the pruners before the first cut and after each cut. Pruners can be sterilized with 70% alcohol, a cleaner like Lysol, or a 10% Clorox solution. 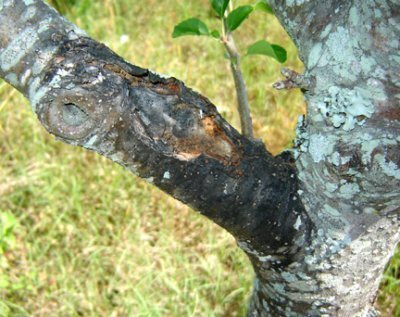 If infected branches are not removed, they develop cankers as the disease overwinters. In the spring, as the sap begins to flow in the tree, the canker begins to ooze with a thick brown liquid filled with bacteria cells that can be splashed by rain, or moved from place to place by pollinators. Fire blight bacteria infects through open wounds or flowers. Most often the infection occurs through the flower. The pollinator may land on a branch that has an oozing canker, then visits the flower and deposits the disease in the nectar. Bacteria cells divide quickly in the nectar and can be transported by other pollinators to other flowers. Once in the flower the disease works its way into the xylem and phloem, the plumbing parts of the plant, plugging it up and causing the leaves and twigs to dry out quickly, giving them the scorched appearance. Using an antibiotic such as streptomycin, or sprays that contain sulfur such as Bordeaux mixes can slow the spread of fire blight when sprayed in the spring while the plants are in bloom. Another method of reducing fire blight in the landscape is to select varieties that are more resistant to the disease. Even among apple and pear trees there are some varieties that are more resistant to fire blight than others. Among flowering pear trees the Cleveland pear is more resistant than Bradford pear. The Seckel pear is the most resistant to the disease, but is still susceptible. A list of apple varieties that are very susceptible to fire blight is available through Cornell University.